Then, quite out of character, our cat Franklin was sitting in the sun in the kitchen. This cat is pretty odd, in that he actually avoids lying in the sun most times. Really? Every cat I’ve ever known has always been able to fill that little shaft of sunlight. Of course I hadn’t actually looked up the setting yet so I got to shooting in colour, figuring he would not stay put too long – but then Averleigh decided she wanted to join him. Sprawled across the floor she stole the spotlight and the sun! He looks a lot more aggravated in this picture than he really was [looking at it now as I post, I should have left his eyes green]. I changed this to black and white but I was disappointed in how dark her face is. A few weak attempts and processing to correct that had me blowing out her foot completely and it just looked stranger. I decided this was the lesson. Shooting in black and white to start would be better if that’s where I wanted to end up. The week went by and a few subjects caught my eye, but time-camera-object never met. Then today I see two of Averleigh’s little kitties sitting on the table in the sun and I thought, hey that would be a neat contrast. I pull out the camera to find the setting and while I’m fiddling I hear a little “plonk”. I look up to see little plastic Playmobil kitty on the floor and Franklin on the table. Busted! Looks like someone wanted the spotlight back after all. Oh yes a green eyed kitty after hearing everyone’s sweet comments about rival house kitty Roxy two weeks ago. He certainly decided that plastic kitties weren’t going to upstage him too. He proceeds to perform. Rubbing his head all over the chair backs and being playful. Oh sure, I just figure out the monochromatic and now I have to find a faster setting so you aren’t just a grey blur… No way he would make it easy right? So I get to the faster setting, get it adjusted and then he won’t move at all! Such.a.cat. I tried to get him to play with the kitties. I know he does when no one is looking since the black plastic one is currently missing. But no, he just posed, made sure I got his best side. The one above is my favourite, love how his whiskers look so fancy. The one below is kind of odd, and has lots of room for improvement technically, but I like it. Dear Franklin: There are now nine photos of you versus one of Roxy. You win. Kindly do not puke across toys and the carpet this week. A fun change of pace to work and think in black and white. I’m so happy to have the excuse to stop and think and learn about these things on this timeline. Yay for Sally!! Now off to see the Studio Sublime to check out all the links. I got all of one shot off before the camera told me it was done. I’m not even sure how to describe some of these colours beyond just calling them pretty. so pretty. I adore melon beads and was just thrilled to see these colourful spring time ones. Great big thanks to Cindy for pulling this all together and handcrafting this gorgeous, glass, copper, and even tea dyed ribbon. I sure do feel like one luck girl! I would be remiss if I didn’t also thank Lori Anderson who has the most uncanny bead ESP for setting up partners. My second time with the BSBP and my second score at having a perfect partner. I hope that I’ll do them proud come reveal time, April 6th. I’ve already got ideas brewing, although I’m sure they will change many times over before the fateful day. Not mine that is, not yet, and holiday Monday will mean Tuesday at the earliest. However, it’s always a bit of a sigh of relief when you know a package has reached an eager recipient safe and sound. Now I get to share with you the soup I sent to Cindy without all the stirring. It took me some time to decide where to start. For me the starting is always the hardest part. Blank canvas type of issues – if you can use any and every colour which one do you start with? Let me tell you for this soup it was my daughter handing me a fistful of crayons: “hereya go mama”. She didn’t even look up from her own drawing. You see I just tape down a bit sheet (from one of those rolls meant for an easel) on the table and the crayons are just always spread across it. I took the five crayons in my hand and thought, huh, not a bad palette you’ve got here. I lined them up on the paper and took a mental note of the names. Later, once she was out of sight, I ripped off the top portion of the page. So the Crayola crap shoot offered up : Scarlet, Timber wolf, Salmon, Tumbleweed and Mahogany at the top of the picture above. You can see the mess of colour the next handful brought to the left. Anyways, looking at the grey and brown together I was reminded of some very fun chrysanthemum stone that I had tucked away. Once I had those stones in my hands I headed towards the worktable. I started mixing a cool grey and didn’t even get the whole way there before I decided I liked the striations coming about and that I should really make some more rocks to go with my rocks! Witness the two rivals above, with the chrysanthemum stone in front and the simple in design, but nicely made sterling clasp. I should have caught a better picture of the edges on these, rather than have then smooth like pebbles I went for a facetted flint like edge. Below you can see a third rival focal made it into the mix. each of these is reversible. I created a small handheld stamp with that bursting pattern, a spin off of the chrysanthemum stone. Here’s the picture with the chrysanthemum stone that actually has the scarlet right there in the stone (the one at about 9 o’clock), across the bottom is a fire agate. I find both these stones are pretty but I think I’ve never designed with them myself since their shapes make me go hmmm. I hope I haven’t been too tricky here. So these were the principle ingredients and them it was off to the pantry and worktable to round out the perfect bead soup. Let me tell you how much fun it is to stand in front of my dear cabinet picking out beads… bead soupers, kindly do not pelt me with beads over my extra special twenty drawer (no it’s no where near full) printer’s chase. Here is the final round up that went out to Cindy to pick and choose and hopefully enjoy working with. The back dish is just as I showed above, but with a couple polymer beads I found going through my drawers. Moving clockwise we have two shell rings (a bit of a darker grey), strawberry fresh water pearls, dyed jade rondelles, padparadascha swarovski crystal, and some puffed polymer beads. Then down in front are a variety of roundabout polymer beads. Some of them started out with a lot more of the pink but the ink in those totally faded in the oven, most curious. Then a little of horn rings to be the “tumbleweed” and the variety of ebony wood beads were as close as I came to the Mahogany. There you have it! Thank you all for your comments last week on my sweet kitty Roxy. I loved how much fur came about from that prompt. Continuing on this week, Sally offered up the prompt to take a moment to enjoy the beauty of flowers. My first thought was I would be visiting a friend and her new baby so of course I would bring flowers. Twist of fate, they were unavailable for a visit (I’ll leave the reason private for them). So I considered getting flowers just for myself to enjoy and photograph, but as the week drew closer to the 14th the cheapskate in me took over. Buy flowers around Valentine’s day ?!? Nope, not for me. Back to basics, I thought about a time when I enjoyed flowers the most. First and foremost would be my wedding day. My mum, aunt and I did all the flowers ourselves. I think I’ll save those for another day though. Thinking back to my childhood there was my first trip to Trinidad where the beauty of flowers was truly overwhelming, like nothing I had ever seen before. This is part of my Aunt and Uncle’s orchid garden. My dad took these pictures on their last trip, a few years ago. The orchids, being air plants, are very happy on these clay pipes that really loomed large when I was four but I guess they are about four feet high. Below you get a better view of the freedom the roots enjoy this way. Of course that all just sets the stage for the main star, the flower! I’m pretty sure these more purple ones are in a separate plot. Really it’s ones that were an even richer purple that I remember specifically. My dad had great shots of them from our trip in 1984, that ended up as enlargements in our guest room growing up. Alas, those particular shots weren’t digital… and not easy for my Dad to dig up and share on short notice :) but I think these shots – all taken by him – are pretty darn good. I can almost feel the humidity! My Uncle tended this garden lovingly for roughly 40 years. He was part of the Orchid Society and displayed at the annual orchid show. He died at the start of this month, peacefully, after many years suffering from Alzheimer’s disease. I had last seen him mid 90s, before any sign of illness, and remember him as a quiet and friendly man – who loved orchids. Looking forward to seeing all the beauty of flowers you all have to share as each week the pictures are so inspiring. Join me in heading over to Sally’s blog for all the links. Oh but before you go… Could I trouble you for a vote? A local photographer is running a contest for a free headshot, the idea, prove that you need it and have people vote for you. I kept to the rules and selected a photo I have used as a bio shot before. Here is the picture and the original it was cropped from. I am hiding the identity of the sweet baby I was holding (not mine) and I’m not even sure really who took the photo for me! So as you can see I could really put a professional shot to good use. Would you be so kind to vote for me? I really appreciate your support. Time to start getting excited about the Bead Soup Blog Party! The time has come for 500 or so participants, matched up by the incomparable Lori Anderson, to swap their soups. This is the seventh edition, my second, and I was very eager to get my soup going and shipped. It’s a good thing there is a deadline, since last night I was frustrated with one part that wasn’t coming together as planned and I almost started over from scratch. Then I decided I was being a bit of a drama queen, since clearly my partner was not going to be able to guess what I had originally envisioned. Ok back to Bead Soup! My partner is Cindy Ritchie whose etsy shop is full of beautiful handcrafted lampwork beads and jewelry. Just look at this row of pretty blue birdies who greet you at the virtual shop doors. Hello, tweet, tweet! So much character in these birds I knew I was in for a treat. The more I looked, the more excited I got. Birds of all sorts including penguins and owls; pigs, cats, and more. Her jewelry is ever so wearable and each piece has these sweet touches, just full of charm, and at totally reasonable prices. 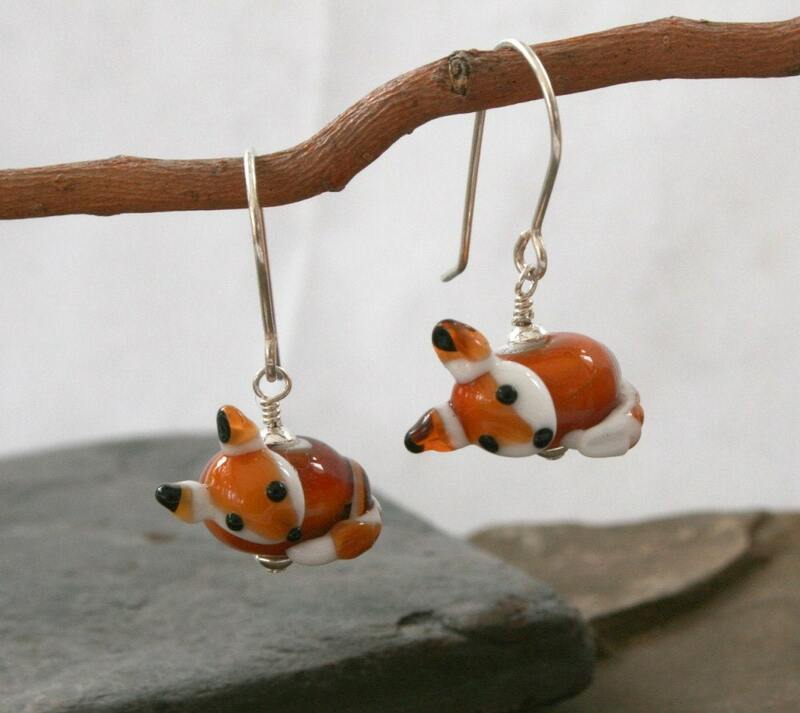 But most of all, you know if you forced me to pick a favourite – just look at these foxes! Couldn’t you just squeeze them? Just like that watched pot, I will be stalking my mailbox for soup arrival. It’s Cindy’s first BSBP and I can’t wait for her to get her package too. It’s wrapped in brown paper (not tied with string) but does include a few of my favourite things. There will be much more to share before our reveal date, the second reveal, April 6th. Looking forward to sharing this experience with Cindy and you all. Let me start by thanking you all sincerely for your comments, enthusiasm and participation in my giveaway post. I’d be creating all the same if not a single soul were watching…but I think it’s better by far to let more voices in on the process. Your comments have sparked many new directions with this one little bead. Your kind compliments, fed the muse’s delicate ego. Having a giveaway was a way to set myself an end date of when I would get these babies in my shop and, hopefully soon, out into the world (plus it’s a lot of fun!) I’m happy to announce that as of today my shop has a new section: Polymer Roundabout Beads. Here’s the starting line up! Thanks to all your ideas, many more iterations will follow. I’m not terribly surprised that wordsmith Erin Prais-Hintz was the one to suggest “roundabout”. I so enjoyed reading all the wonderfully creative names you all offered up, but kept returning to this idea of a roundabout. Picturing it from above with many lanes, it goes off in many directions and at any time could be filled with a wide variety of colourful cars and trucks (or I suppose, in some parts of the world, scooters, bicycles and livestock). Oh yes, what bounty of ideas could spring from such a name. I must think of creative way to thank Erin for this thought. Oh I so hope she does! Thanks so much everyone and Sherri I’ll drop you a line for your mailing address. Last week I was boasting about how cute my daughter’s politeness streak is. That she enjoys opening her door to let the cat leave post snuggle every night. Cat walks through and she sweetly says: “You’re welcome Roxy”. Now I think you should meet Roxy. Roxy was a shelter kitty. We almost missed seeing her entirely. My husband caught sight of her just before we left the shelter. I read her little card and saw she was a girl, had a cold, and was polydactyl. I just had to see. they opened the cage I slipped my hand under her sleeping belly and as soon as I cupped it she was purring. Instant love. Wouldn’t you know it we were then two minutes past the time for adoptions so we had to leave without her. They said they could put a hold for one day, but then there was a whole impossible schedule to get back. Long story short I picked up the phone the next day they were open and negotiated that I would go in on my lunch, start the paperwork, and then pick her up after my shift (which was after the last adoption time, hence the complication). Of course the person working on the paperwork at my lunch hour didn’t seem to register that I was taking her later even though I pointed it out several times. I very nearly had to have her under my desk for half a day but it worked out in the end. Anyways all that was five years ago and I now work remotely from my home and Roxy usually hangs out with me most of the day. Occasionally she hops on the desk and nibbles my elbow while I work requesting a place on my lap and a little cuddle. She kneads my thigh with both six-toed front paws and purrs loudly. She is a picture of love in every way. Ain’t she a sweetie! And look she’s a little heart face too. Looking forward to seeing everyone’s little frozen moment of love, head on over to Sally’s blog to see the love multiplied. Today is a three post day! Hello and Welcome! Today is a busy day here at the blog and I’m going to reward you all for putting up with me with a little giveaway at the end of this post. I’m pretty sure it was a post on facebook from Erin Siegel that lead me to find Tracy Statler’s Make Bracelets! blog and this Wellness words jewelry challenge. Reading Tracy’s post I was excited to complete the idea of choosing a word for the year by making it into a piece of jewelry to wear as a reminder. At that point I had already selected the word MANIFEST and creating a talisman to reinforce this sounded like just the kind of action I should take – so I hopped on board. I call myself a blue girl and I knew this piece would be blue all over. This reverse of the focal is actually a test piece from the gift I made my dad for Christmas. It was handy so it was pressed into service as a connection point for the knotted bead chain and the dangling bottle. This bottle is a recycled, unused, cryogenic vial. Did I hear you say “huh?” - It’s a plastic screw top vial, liquid tight, that is used for storing lab specimens and such in the very cold freezers like -86C. Covered in polymer I thought it would be the perfect keeper for things I would like to manifest. With the aid of a strip of quilling paper and a fine pen I have 20 inches of things to manifest rolled up and tucked neatly inside. Can you read my handwriting on the centre of that blue poppy-esque flower? It says manifest. I thought of serveral ways of including the word but in the end writing it on felt like the natural choice. I have a whole pack of this quilling paper so I can always add new thoughts and intentions to my vial as the years go by. The lampwork you see just above the cap is from Karolen Deupree and there are a few more sprinkled in with my polymer beads. These disk beads that are knotted with waxed lined to form the chain to throw this necklace over my neck are a new design I’ve been playing with. I spent the week with different patterns and colours and I really enjoyed the balance of control versus serendipity with this little bead. I would love the hear your thoughts on these new beads. How would you use them? Ideas for colour palettes you would enjoy seeing? What would you call them? (I’m struggling with a descriptive name) Ombre sets? You see I usually try something out and if I get a little uneasy about it it can sit in a box for a few years. I don’t want to see that happen to these little babies cuz I think they have potential. So I want to live up to my word and manifest these little beads into a line in my shop. I’d love your feedback to get me rolling. Leave a comment on THIS post. For additional entries share this giveaway on your favourite social media, please leave a separate comment each time you do so that I can count ‘em up nice and easy when it comes time to select a winner (from anywhere on earth). Since there are several hops I’m taking part in today I will leave the contest open until Friday Feb 8 midnight EST. Sound good? Ok that’s more than enough from me today! Thank you for reading all the way through. Thank you to Tracy for the inspiration. Please follow on to see what all these talented ladies made to make 2013 a banner year. apolymerpenchant.com - You are right here, thanks for coming! I don’t work with wire very often – in fact I usually avoid it. This year I decided that simply wouldn’t work anymore; I needed to get my wire work up to par. So I joined the Aspire to Wire e-course and I am having just the best time I will be so sad when it is over. I used the bulk of the lucite beads to create a wire wrapped chain. This is something I have never really sat down and had patience with myself to complete. It’s not perfect, but I’m pleased it’s not sloppy. From there the rest of my plans got thrown out the window as recent course projects started to play in my head. The coiled wire knot took centre stage. I created a polymer flower accent and filled it with Kerry’s version of wire french knots. On the left I painted one of my head pin experiments to dangle and created a simple hook clasp. I also made matching earrings which is usually a rare occurrence for me. I did not make the ear wires myself as I already had some nice handmade ones it was high time they got used. I had so much fun with this challenge of a colour palette for me. It' got me off exploring my new wire knowledge and I’m anxious to try more. I’m very interested to see what everyone else came up with from their surprises, please check them out below. Thank you so much Lisa for letting me play along! P.S – next post up today includes a giveaway, I’d love to have you back! Here are the main shots of January. I had so much fun getting each of these and I’m very happy for the chance to have this lovely weekly inspiration and encouragement from the whole group and Sally especially. Averleigh and I shared lunch and at her request, we had pear. As I was cutting it the seeds from one quarter that I was cutting fell on my thumb and I flicked them off – OMG straight onto the next piece – is that a heart? Me: “Eeeee!” put down the knife. wipe hands on shirt. run into other room to grab iPhone. Me: “Here babe, here are your pieces” picture taken, pear cut and in front of her. I imagine at least a few more “Where?”s followed, but I’ll spare ya. I’m basically in love with this picture since she gets quite excited about having pear and usually brings it up by saying “dada bought pear – Hooray! Pear please.” and throws her arms up in the air. It’s one of my favourite current lines and reminds me I should be writing these things down. Indulge me one more! She’s big on politeness and can only recently reach to open and close doors. So she enjoys opening her door to let the cat leave post snuggle every night. Cat walks through and she sweetly says: “You’re welcome Roxy”. Mama boast over. Oh yes my captured heart has completely captured my heart.